CDC recently launched an app to help vaccination providers quickly and easily determine which pneumococcal vaccines a patient needs and when. Users simply enter a patient’s age, note if the patient has specific underlying medical conditions, and answer questions about the patient’s pneumococcal vaccination history. Then the app provides patient-specific guidance consistent with the U.S. Advisory Committee on Immunization Practices recommended immunization schedule. 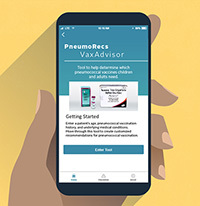 Get the PneumoRecs VaxAdvisor mobile app now for iOS and Android devices.